We would love to share our love to the desert with our guest. We will inform you with a lot of information about the Bedouin Life, traditions, and habits, We love to help our visitor to discover our Bedouin culture by telling them Bedouin stories, singing Bedouin song, playing Bedouin games, cooking delicious Bedouin traditional food, and explaining our way of the life. We promise you with best services in tours and camping. The area is now also one of Jordan’s important tourist destinations, and attracts an increasing number of foreign tourists, particularly trekkers and climbers, but also those looking for camel and horse safaris or simply ‘day-trippers’ from Aqaba or Petra. Wadi Rum is dominated by Jabal Rum, the second highest peak in Jordan and the highest peak in the central Rum (1734 metres above sea level). The highest peak in Jordan, Jabal Um Adaami, is south of Rum close to the Saudi border. On a clear day, it is possible to see the Red Sea and the Saudi border from the top. It is now a very popular trek from Rum village. The influx of tourists to this once isolated area has substantially increased the financial fortunes of the Bedouin people, and it is common to see locals using mobile phones and driving four-wheel drive vehicles; many also have wi-fi and computers to run their adventure tourism businesses. However, the Bedouin have not abandoned their culture and its famous hospitality. 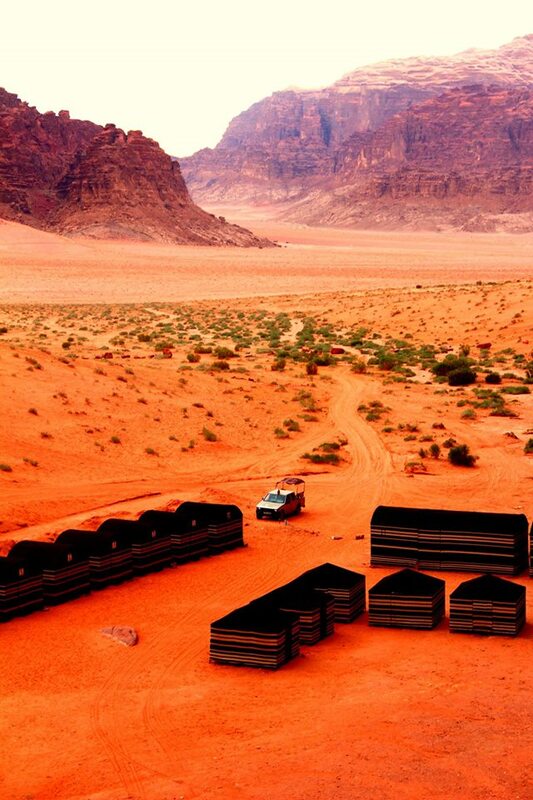 Shuttle to the camp from Wadi Rum village: The latest free shuttle to the camp, which is included to the price, is at 6:00 pm, So please try to arrive 6 pm. Otherwise if you arrive after 6 pm this costs you 10 JD per person for the transfer to the Camp.